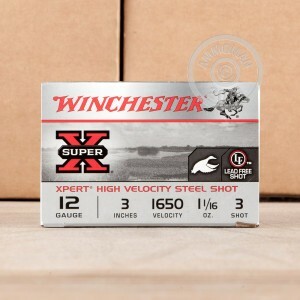 This 12 Gauge shotshell from Winchester’s Super-X line of ammunition is loaded with 1 1/16 ounces of #3 Xpert steel shot. The .13” pellets are resistant to corrosion, so taking them to places where waterfowl thrive will not impact their integrity, and they are extremely hard so they will not deform during their passage through the barrel. This shell possesses a staggeringly fast muzzle velocity of 1,650 fps. Its speed very much makes up for steel’s lesser momentum than lead’s -- as a result, you can enjoy shorter leads and longer range while you’re using this shell for duck hunting. 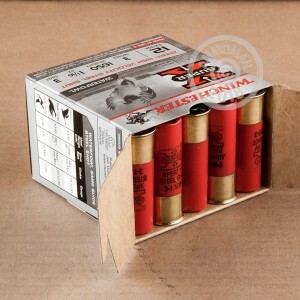 That its shot is steel also means you may fire this shell in sensitive wetlands while keeping the game warden on your good side. 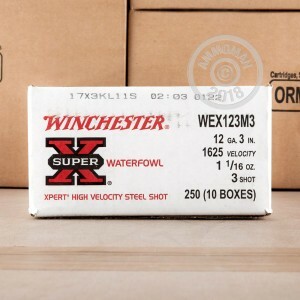 The Super-X brand, which offers outstanding quality, performance, and value, has kept hunters well-supplied since its introduction in 1922.